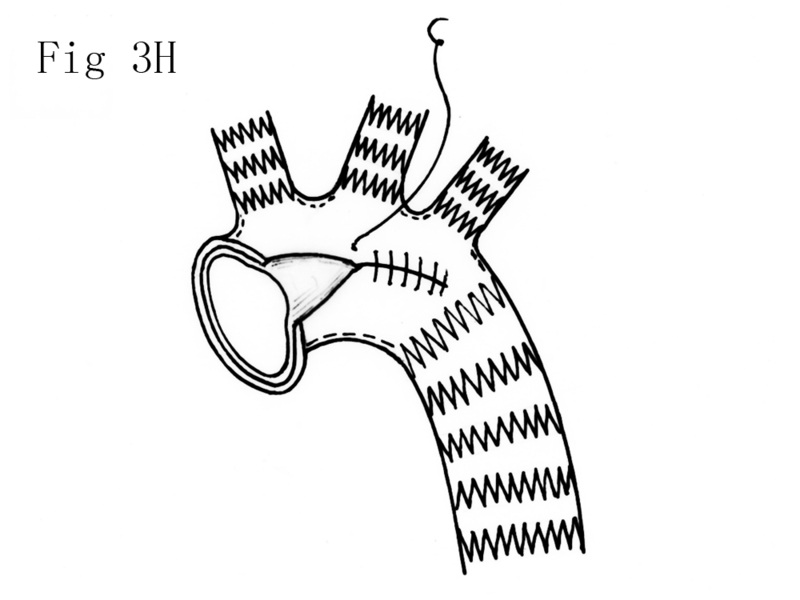 In total arch repair with open placement of a triple-branched stent graft for acute type A aortic dissection, the diameters of the native arch vessels and the distances between 2 neighboring arch vessels did not always match the available sizes of the triple-branched stent grafts, and insertion of the triple-branched stent graft through the distal ascending aortic incision was not easy in some cases. To reduce those two problems, we modified the triple-branched stent graft and developed the arch open technique. Total arch repair with open placement of a modified triple-branched stent graft and the arch open technique was performed in 25 consecutive patients with acute type A aortic dissection. There was 1 surgical death. Most survivors had an uneventful postoperative course. All implanted stents were in a good position and wide expansion, there was no space or blood flow surrounding the stent graft. Complete thrombus obliteration of the false lumen was found around the modified triple-branched stent graft in all survivors and at the diaphragmatic level in 20 of 24 patients. The modified triple-branched stent graft could provide a good match with the different diameters of the native arch vessels and the various distances between 2 neighboring arch vessels, and it’s placement could become much easier by the arch open technique. Consequently, placement of a modified triple-branched stent graft could be easily used in most patients with acute type A aortic dissection for effective total arch repair. Acute type A aortic dissection usually requires emergency surgical management to prevent death resulting from aortic rupture ,. Although the dissection frequently involves entire aorta, the dissected ascending aorta is most common segment to rupture. Therefore, the simple ascending aortic graft replacement is widely accepted as the conventional treatment for acute type A aortic dissection -. This conventional operation has improved the life prognosis for the acute phase, but residual dissection in the arch and downstream aorta can still occur after the conventional ascending aortic replacement, which has been widely proven to affect the long-term prognosis -. When continuous enlargement of the residual dissection occurs, the chances of survival might remain in hazard, and difficult reoperation is inevitable. This unsatisfactory long-term prognosis would favor simultaneous replacement of the ascending aorta and total arch in the same surgical field during the primary emergency operation . Total arch replacement is very complex and highly invasive if it is performed with the traditional method, which makes the risk of this procedure very high in patients with acute type A aortic dissection . Whether this traditional total arch replacement with possible additional operative risk can be justified from the viewpoint of potential long-term benefits remains controversial ,. Therefore, traditional total arch replacement can’t be widely accepted as preferred surgical treatment for acute type A aortic dissection during the emergency repair. It would be desirable if one technique could effectively repair total arch while keeping the surgical invasion and risk as low as possible. Recently, we developed open triple-branched stent graft placement technique, in which total arch repair could be simply completed by inserting a triple-branched stent graft into the proximal descending aorta, arch and 3 arch vessels through the same transverse aortic incision line as ascending aortic replacement . Clinical results showed that our new technique could reduce the risk and technical difficulty of total arch repair to close to those of the conventional ascending graft replacement with open distal anastomosis . Therefore, this new simple technique could be an attractive alternative to traditional total arch replacement for acute type A aortic dissection. However, in our practice with this new technique, two major problems were found. First, this new technique could not be applied in most patients, because the diameters of the native arch vessels and the distances between 2 neighboring arch vessels did not always match the available sizes of the triple-branched stent grafts. Second, the arch vessel orifices and the true lumen of the descending aorta could not be clearly seen through the distal ascending aortic incision in some cases, so inserting of the triple-branched stent graft in such cases was not easy. In an effort to reduce those two problems, we modified the triple-branched stent graft to the new generation, which could provide a good match with the different diameters of the native arch vessels and the various distances between 2 neighboring arch vessels, and developed the arch open technique to make the placement much easier and safer. 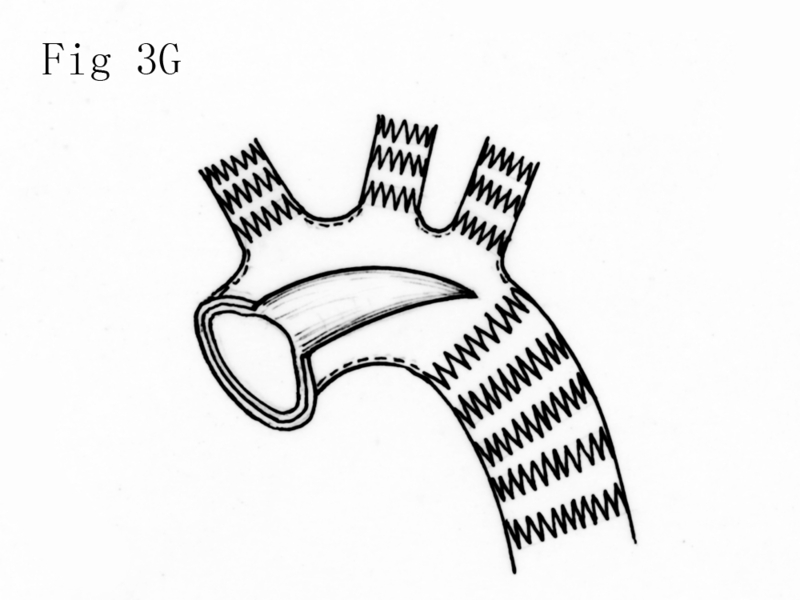 Here, we describe our application of this new generation of triple-branched stent graft and the arch open technique for total arch repair in patients with acute type A aortic dissection. In addition, we report our initial clinical results in 25 consecutive patients. Between November 2012 and June 2013, 25 consecutive patients with acute Stanford type A aortic dissection underwent total arch repair with open placement of a modified triple-branched stent graft and the arch open technique. This procedure was approved by the ethics committee of Union Hospital, Fujian Medical University, and written informed consent was obtained from each patient or legal representative. There were 21 men and 4 women. The average patient age was 49.92 ± 13.04 years (range, 20 to 74 years). Preoperative diagnosis was based on electron beam computed tomography, echocardiography and magnetic resonance imaging. The primary intimal tears were located in the ascending aorta in 13 patients, in the arch in 4 patients, and in the proximal descending aorta with retrograde extension of the dissection into the arch and the ascending aorta in 8 patients. The dissection had extension to the innominate artery in 23 patients, to the left common carotid artery in 5 patients and to the left subclavian artery in 5 patients. A history of hypertension was found in 17 patients and 11 of them didn’t receive effective antihypertensive treatment. Four patients had diabetes melitus, 2 had classic Marfan syndrome and 1 had chronic renal dysfunction. There were some preoperative complications related to the aortic dissection including moderate or severe aortic valvular regurgitation in 5 patients, cardiac tamponade in 1, transient brain ischemia in 1, and acute renal dysfunction in 3. All operations were performed within 4 hours after the diagnosis was confirmed. The average interval between the onset of pain and operation was 3.0 ± 2.3 days (range, 1to 9 days). In this study, total arch repair for acute type A aortic dissection was on the basis of one of the following indications: (1) the patient was < 55 years of age; (2) the intimal tear located in the transverse arch or proximal descending aorta that could not be resected by hemiarch replacement; (3) there was serious involvement of the arch vessels; or (4) Marfan syndrome was present. The modified triple-branched stent graft (conceived and designed by two of us (LWC and CL) and manufactured by Yuhengjia Sci Tech Corp Ltd, Beijing, China) consisted of a self-expandable nitinol stent and polyester vascular graft fabric. The polyester vascular graft fabric was thin and soft enough to be easily folded. Each modified triple-branched stent graft comprised a main tube graft and 3 sidearm tube graft. Our modified triple-branched stent graft was designed to provide a good match with the different diameters of the native arch vessels and the various distances between 2 neighboring arch vessels. For this purpose, two major modifications were developed. First, the polyester tube graft and the stent for each native arch vessel or arch were not attached together before implantation, and they were implanted separately. Second, the diameter of the sidearm polyester tube graft was designed to be bigger than that of most corresponding arch vessels, and the distance between 2 neighboring sidearm tube grafts was longer than that between 2 corresponding arch vessels of most Chinese adults. After a bigger sidearm tube graft was inserted into the corresponding smaller arch vessel, a stent with the size proportional to that of this arch vessel was selected and inserted, which resulted in longitudinal fold of the implanted bigger sidearm tube graft to match this arch vessel. When the implantation of 3 sidearm tube grafts and their stents into the corresponding arch vessels was completed, an arch stent with the size proportional to the arch size was inserted into the main tube graft. As a result, the main tube graft between two sidearm tube grafts was transversely folded to match the distance between two corresponding native arch vessels. In this study, two types of our modified triple-branched stent graft were produced. Type 1 was designed to provide a good match only with the various distances between 2 neighboring arch vessels, and type 2 was designed to provide a good match with both the different diameters of the native arch vessels and various distances between 2 neighboring arch vessels (Figure 1). There were two types of our modified triple-branched stent graft. In type 1 modified triple-branched stent graft, all 3 sidearm tube grafts and distal portion of main tube graft were stented while the proximal portion of main tube graft was unstented before implantation (A). 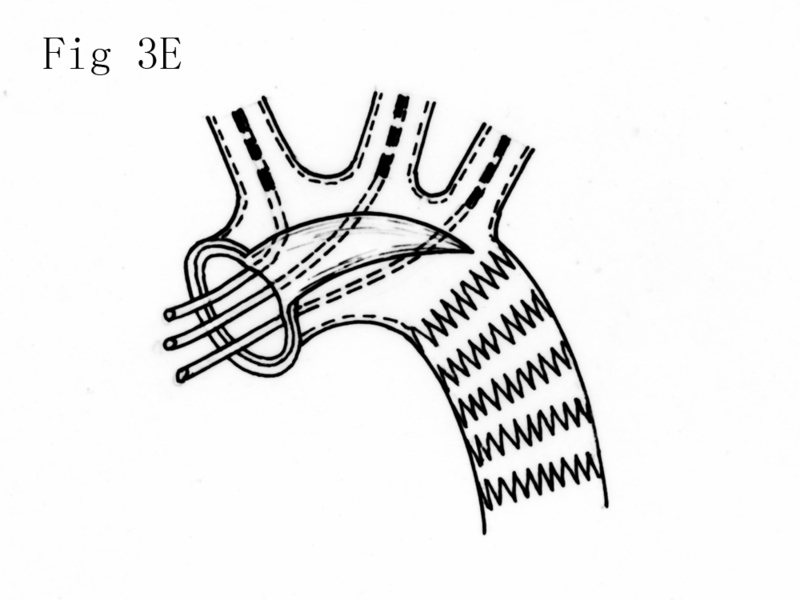 In type 2 modified triple-branched stent graft, only the distal portion of the main tube graft was stented while all 3 sidearm tube grafts and the proximal portion of main tube graft were unstented before implantation (B). The main tube graft and 3 sidearm grafts were individually mounted on 4 catheters and restrained by 4 silk strings (C). In both types, the tapered main tube graft was 145 mm in length, 32 mm in proximal diameter and 28 mm in distal diameter. The proximal portion of the main tube graft was unstented before implantation and designed for arch repair while the distal portion was stented and acted as a stented elephant trunk. The distance between 2 neighboring sidearm graft was 12 mm (longer than that between 2 corresponding arch vessels of most Chinese adults). All three sidearm tube grafts were 3.5 mm long in both types. In type 1, all three sidearm tube grafts were stented before implantation. The first sidearm stent graft was 14 or 16 mm in diameter, and both the second and third sidearm stent grafts were 12 or 14 mm in diameters. In type 2, all three sidearm tube grafts were unstented before implantation. The first sidearm tube graft was 20 mm in diameter (bigger than most innominate arteries), and both second and third sidearm tube grafts were 16 mm in diameter (bigger than that of most corresponding arch vessels). The main tube graft and 3 sidearm grafts were individually mounted on 4 catheters and restrained by 4 silk strings. Stents for arch or arch vessel were multiple rings of self-expandable nitinol wire (Yuhengjia Sci Tech Corp Ltd, Beijing, China). 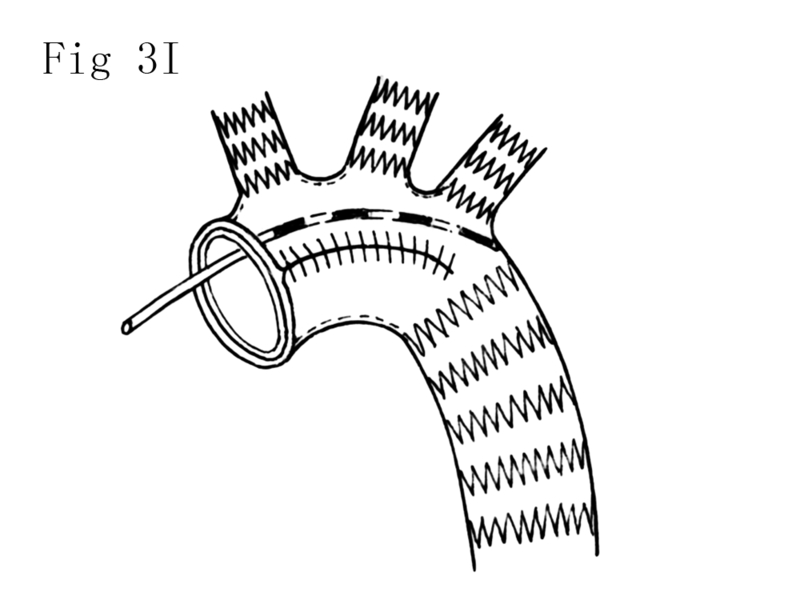 In each stent, the multiple rings were connected to a polyester vascular fabric felt (Figure 2). Therefore, the stent had bare stent portion and polyester fabric portion. The arch stent was 60 mm long and 26 to 34 mm in diameter, and the arch vessel stent was 30 mm long and 12 to 20 mm in diameter. The diameter of the stent selected was 10% to 20% bigger than the size of the corresponding landing zone ,. Stents for arch or arch vessel. 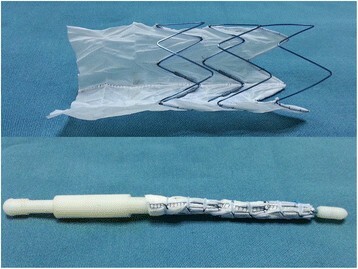 The stent made of multiple rings of self-expandable nitinol wire, and those rings were connected to a polyester vascular fabric felt. All procedures were performed with patients under general anesthesia and cardiopulmonary bypass. The patient was placed in a supine position. The right axillary artery was exposed using subclavian incision and a median sternotomy was performed. Cardiopulmonary bypass was established by 2 venous cannulas via the right atrium and the arterial return cannula placed in the right axillary artery. Cardiopulmonary bypass flow was maintained between 2.4 and 2.6 L · min−1 · m−2. Myocardial protection was achieved by multiple antegrade perfusion of cold blood cardioplegic solution (4°C). During core cooling, the innominate and left common carotid arteries were free from surrounding tissue and exposed as long as possible. When the patient was cooled to 32°C, the aorta was clamped just proximal to the innominate artery, and transected just above the sinotubular juncton. Manoeuvres such as aortic valve repair and sinus of Valsalva reconstruction were performed. The transected proximal stump of the ascending aorta was reconstructed and subsequently connected to the 1-branched Dacron tube graft (26 or 28 mm in diameter, a product of Intergard, Intervascular, Datascope Co, Montvale, NJ). When the rectal temperature reached 22°C, cardiopulmonary bypass was discontinued and selective antegrade cerebral perfusion via the right axillary artery was established at a rate of 10 to 15 mL · kg−1 · min−1. 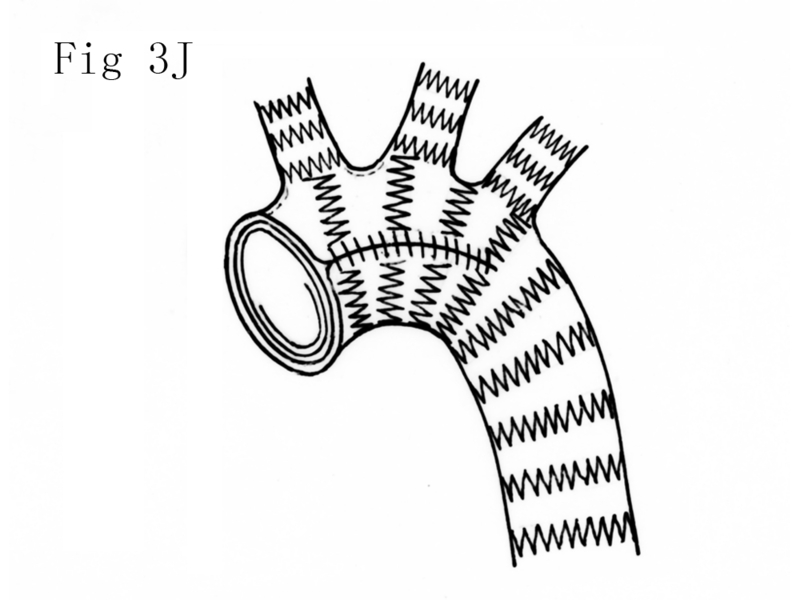 After the innominate and left common carotid arteries were cross-clamped (4 cm above the arch), the distal ascending aorta was transected at the base of the innominate artery and the arch was longitudinally opened at the anterior wall (Figure 3A). 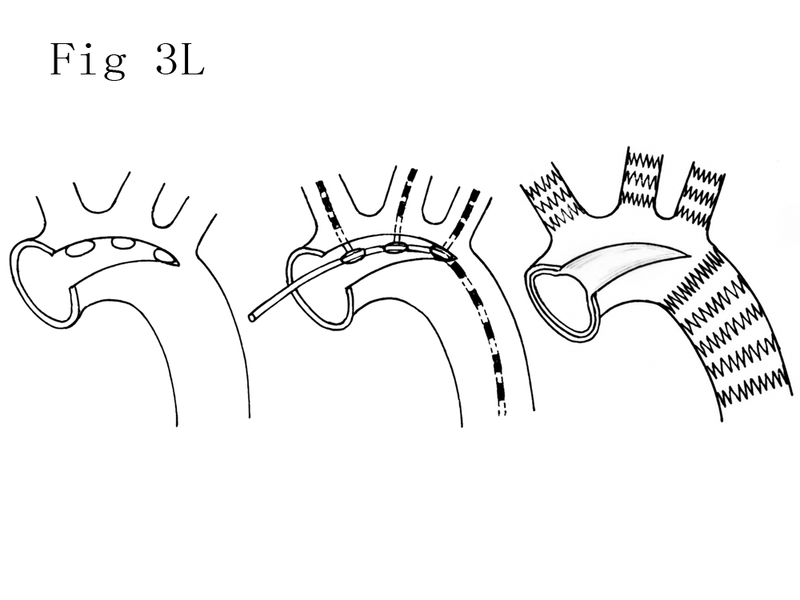 Through those aortic incisions, the main tube graft was placed into the true lumen of the arch and proximal descending aorta, and then each sidearm tube graft was implanted one by one into the corresponding arch vessel (Figure 3B, C). 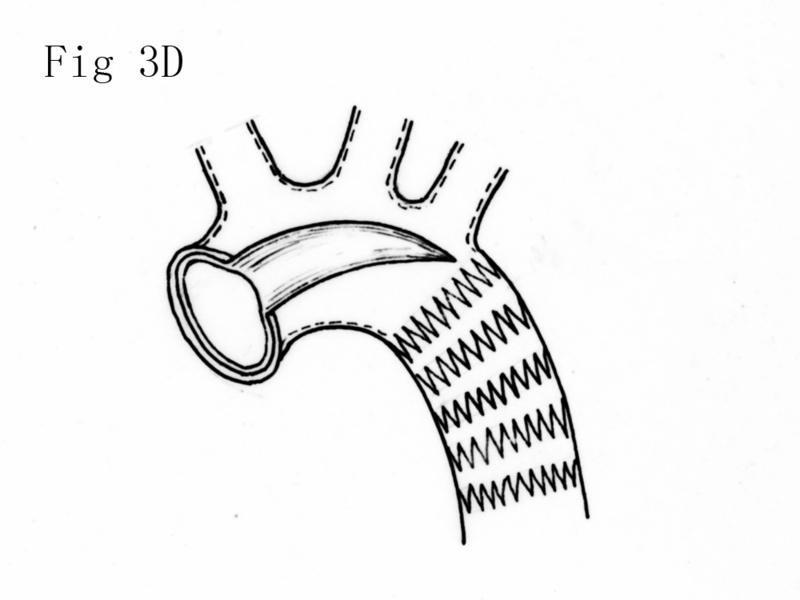 Once the main tube graft and sidearm tube grafts were properly positioned, the restraining strings were withdrawn and tube grafts were deployed (Figure 3D). 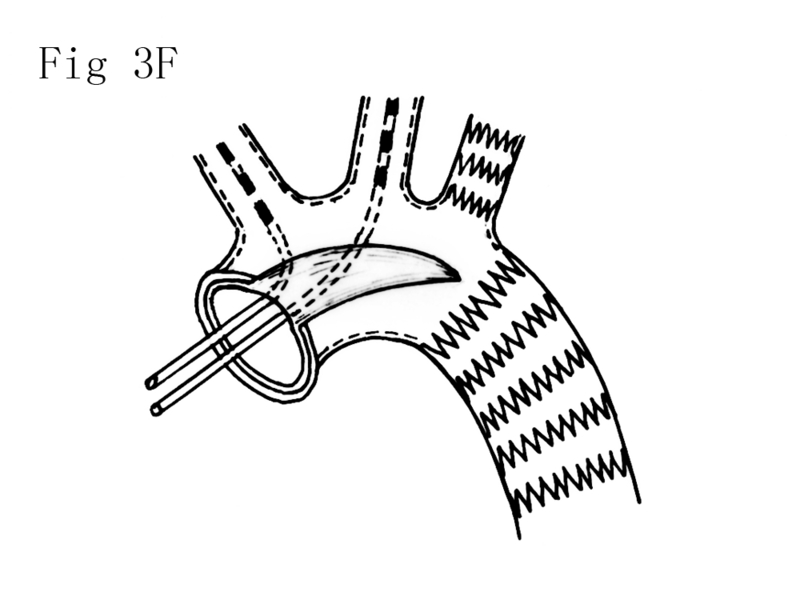 Each sidearm stent with the size proportional to that of corresponding arch vessel was selected and anchored into the implanted sidearm tube graft (If type 2 modified triple-branched stent graft was used), which resulted in longitudinal fold of the sidearm tube graft inside the corresponding arch vessel to match this arch vessel (Figure 3E, F, G). 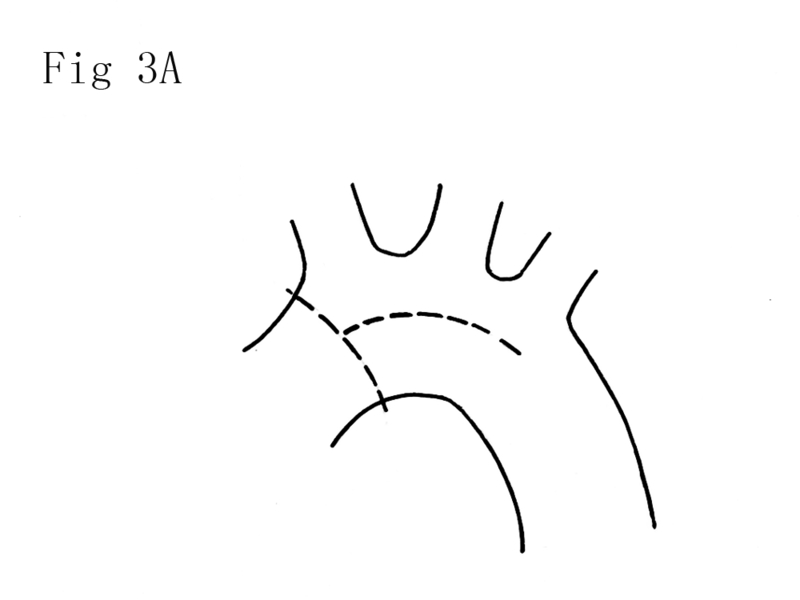 Then, a continuous 4–0 polypropylene suture was used to close the arch longitudinal incision with incorporation of the main tube graf (Figure 3H). 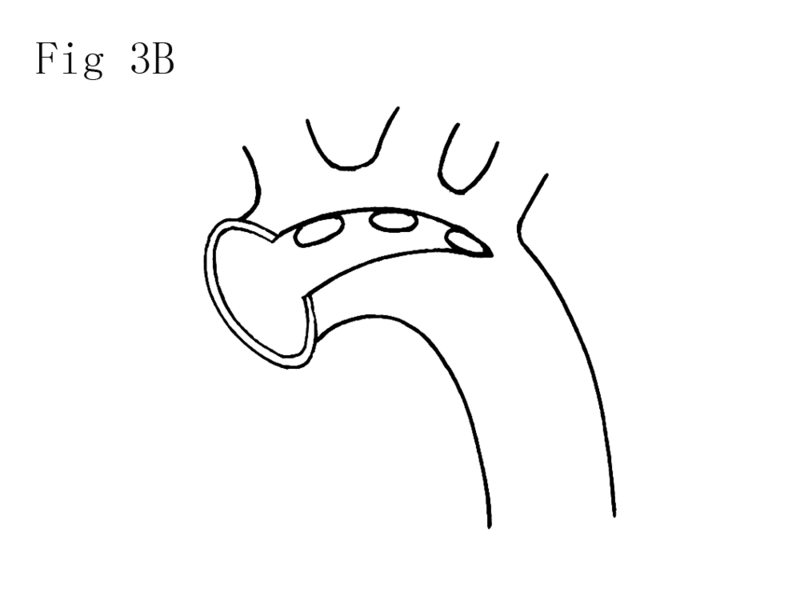 Finally, the arch stent with the size proportional to the arch diameter was inserted and deployed into the proximal portion of the main tube graft (the bare stent portion towards the arch vessel orifices), which resulted in transverse fold of the main tube graft between two sidearm tube graft to match the distance between two corresponding arch vessels (Figure 3I, J). 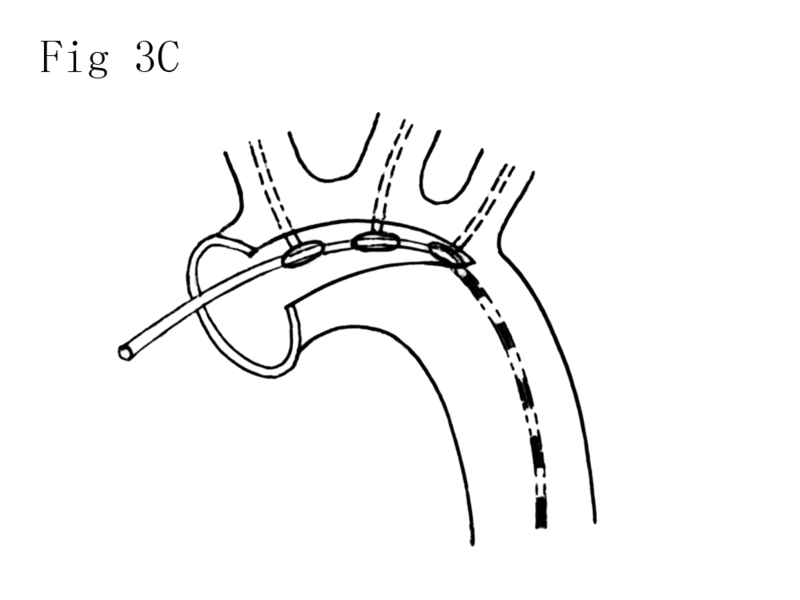 The transected distal stump incorporating the main tube graft and the polyester fabric felt of the arch stent was directly anastomosed to the distal end of the 1-branched Dacron tube graft with a continuous 4–0 polypropylene suture (Figure 3K, L). Schematic diagram of the operation. After the distal ascending aorta was transected at the base of the innominate artery and the arch was longitudinally opened at the anterior wall (A), the arch vessel orifices and the true lumen of the descending aorta could be clearly seen (B). The modified triple-branched stent graft was inserted and deployed into the true lumen of arch, proximal descending aorta and 3 arch vessels (C, D). Each sidearm stent with the size proportional to that of corresponding arch vessel was selected and anchored into the implanted sidearm tube graft (E, F, G). The arch longitudinal incision was closed with incorporation of the main tube graf (H). Finally, the arch stent was inserted and deployed into the main tube graft (I, J). The transected distal stump incorporating the main tube graft and the polyester fabric felt of the arch stent was directly anastomosed to the distal end of the 1-branched Dacron tube graft (K). If type 1 modified triple-branched stent graft was used, only the tube graft for arch and the arch stent were implanted separately (L). After the air was carefully flushed out from the modified triple-branched stent graft, antegrade systemic perfusion from the branch of the 1-branched Dacron tube graft was started, and the patient was rewarmed. During the rewarming, arterial banding at the dissected arch vessel’s base was applied in the patients with type 1 modified triple-branched stent graft implantation. The banding felt was Dacron tube graft ring with 3 mm in width and 5-10% shorter than the size of the implanted sidearm stent graft in length. Patients were followed up after they were discharged. They were contacted by telephone or direct interview in our department. Contrast-enhanced computed tomographic scan and echocardiographic examination were prospectively performed on the following schedule: before discharge, 3 months after the operation, and annually thereafter. The effectiveness of the open placement of a modified triple-branched stent graft was estimated by complete thrombus obliteration of the false lumen surrounding the modified triple-branched stent graft. To demonstrate the fate of the descending thoracic and abdominal aorta after surgery, the diameter of the dissected aorta at the diaphragmatic level and diameters of both the dissected aorta and false lumen at the level of the superior mesenteric artery were collected in each computed tomographic examination, including the preoperative computed tomographic scan. Methods used to measure of those diameters have been described in the literature . Continuous data were expressed as mean ± SD. A repeated measures ANOVA was used to compare the diameters of the dissected aorta and false lumen before surgery, before discharge, and at 3 months after surgery. The differences over the 3 time points were compared with a 2-df test; the individual time point could then be compared each other by use of a mixed model approach if the differences were significant. All analyses were performed with SAS 9.0 software (SAS Institute Inc, Cary, NC). A value of P < 0.05 was considered significant. Placement of the modified triple-branched stent graft into the true lumen of the proximal descending aorta, arch and 3 arch vessels was technically successful in all 25 patients, and insertion of the stents for the 3 arch vessels and the arch into the corresponding tube grafts could be easily completed. Type 1 modified triple-branched stent graft was used in 23 patients and type 2 was used in 2 patients. Postoperative chest X-ray indicated that all implanted stents were in a good position and wide expansion. Complete resection or sealing of the targeted entry sites with this procedure were confirmed by intraoperative transesophageal echocardiography. The mean cardiopulmonary bypass time was 165.24 ± 20.81 minutes (range, 122 to 203 minutes), aortic cross-clamp time was 65.23 ± 15.60 minutes (range, 40 to 119 minutes), and selective cerebral perfusion and lower-body arrest time was 28.40 ± 7.45 minutes (range, 15 to 48 minutes). Concomitant procedures included aortic valve repair in 2 patients (not including commissural resuspension), Bentall procedure in 2 patients and sinus of Valsalva reconstruction in 21 patients. In this series, there was 1 in-hospital death. This patient had preoperative cardiac tamponade and acute renal dysfunction. Although the patient had an uneventful operative course and was extubated on 3rd postoperative day, heart arrest occurred on 7th postoperative day during the blood dialysis. After the resuscitation, hemodynamics was stable and transesophageal echocardiographic examination showed that no re-dissection or rupture in repaired aorta was found. But this patient died of multi-organ failure 10 days after the operation. Hemostasis was not a problem in those patients. No patients required additional surgery to correct excessive postoperative bleeding. Postoperative cerebral complications include infarction in 1 patient and global temporary neurologic dysfunction in 2 patients, but they fully recovered before hospital discharge. Acute renal failure complicated postoperative care in 3 patients with 2 requiring dialysis. No pulmonary complication resulted. The postoperative mechanical ventilation support period was 22 ± 7.9 hours (range, 15 to 48 hours) and the duration of intensive care unit stay was 2.2 ± 1.2 days (range, 1 to 6 days). Postoperative computed tomography showed that all stents were fully opened and not kinked; there was no space or blood flow surrounding the modified triple-branched stent graft. 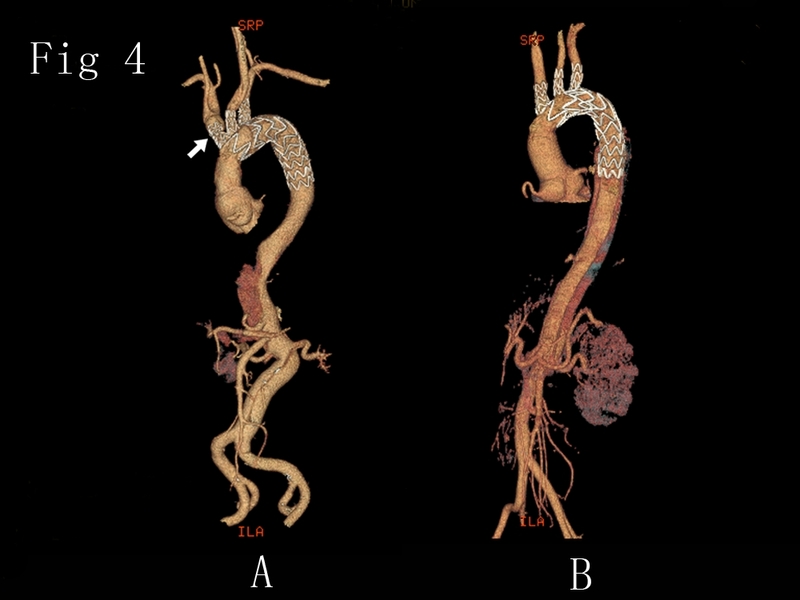 The false lumen in the arch and the descending aorta covered by the modified triple-branched stent graft closed with thrombus in all survivors (Figure 4). No significant sidearm graft stenosis or occlusion was found. Disappearance of the false lumen and recovery of the true lumen was observed in all dissected arch vessels. 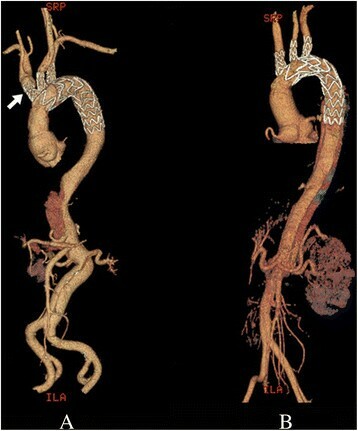 Postoperative computed tomographic scan showing that all stents were fully opened and not kinked and that there was no space or blood flow surrounding the stent graft. A, type 1 modified triple-branched stent graft placement combined with banding at the dissected annominate arterial base. B, type 2 modified triple-branched stent graft placement. At the diaphragmatic level, the false lumen of the descending aorta distal to the stent graft closed with thrombus in 20 of 24 patients at their first and second postoperative images. At this level, the aortic diameter was 29.42 ± 2.18 mm preoperatively, 27.29 ± 2.55 mm before discharge, and 26.92 ± 2.16 mm at 3 months after surgery. A significant difference in the aortic diameters at this level over the 3 time point was found (P < 0.05). Compared with the preoperative data, both aortic diameters before discharge and at 3 months after surgery reduced significantly (P < 0.05 for each), but there was no significant difference in the aortic diameter between before discharge and at 3 months after surgery (P = 0.54). At the superior mesenteric arterial level, a patent false lumen present in all survivors’ first and second postoperative computed tomographic images. The aortic diameter at this level was 26.25 ± 2.74 mm preoperatively, 26.21 ± 2.08 mm before discharge, and 25.58 ± 2.06 mm at 3 months after surgery. There was not significantly different in those aortic diameters over the 3 time points (P = 0.63). The diameter of the false lumen was 14.71 ± 1.97 mm preoperatively, 9.0 ± 2.4 mm before discharge, and 8.5 ± 2.0 mm at 3 months after surgery. A significant difference in the diameters of the false lumen at this level over the 3 time points was found (P < 0.05). Compared with preoperative data, both diameters of the false lumen before discharge and at 3 months after surgery reduced significantly (P < 0.05 for each), but there was no significant difference in the false lumen diameter between before discharge and at 3 months after surgery (P = 0.21). All survivors were followed up to the end date of this study (September, 2013). The follow-up was 100% complete. The mean follow-up period was 5.2 ± 2.1 months (range, 3 to 10 months). During the follow-up, no any severe complication related to the surgery or residual dissection was found, and there were no late deaths and no need for reoperation. All survivors resumed normal activities. Endovascular stent graft placement has widely been confirmed as an effective and less invasive alternative to surgical repair for acute aortic dissection -. In this study, we successfully applied our open modified triple-branched stent graft placement for total arch repair in 25 consecutive patients with acute type A aortic dissection. Placement of these modified triple-branched stent grafts and stents into the descending aorta, 3 arch vessels and arch could be easily completed in 2–3 minutes. Most patients had an uneventful postoperative course and were discharged from hospital without complications. Their postoperative computed tomographic scans showed that all stent grafts were fully opened and not kinked, there was no space or blood flow surrounding the modified triple-branched stent graft and no sidearm graft stenosis or occlusion. These preliminary results demonstrated that our modified triple-branched stent graft placement technique can be used in most patients with acute type A aortic dissection for effective total arch repair. 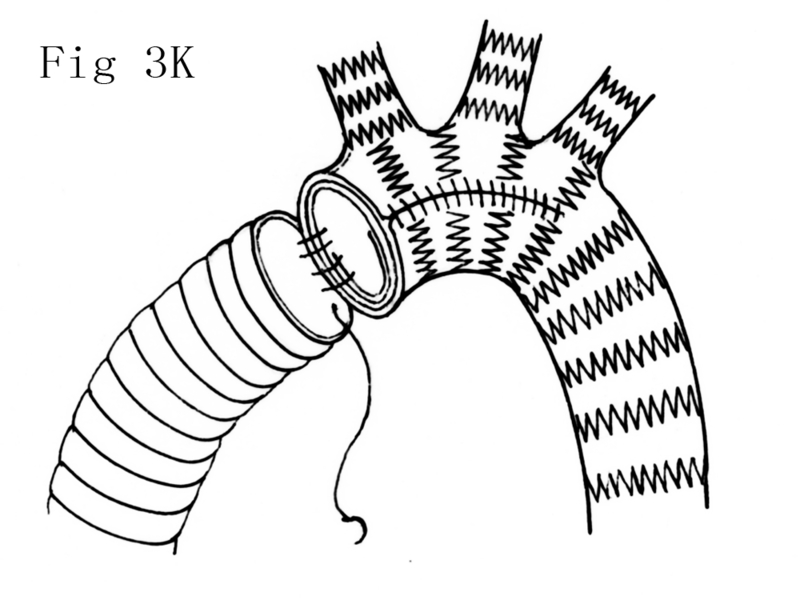 In the first generation of triple-branched stent graft placement technique, the stent graft was inserted into the proximal descending aorta, arch and 3 arch vessels through the distal ascending transverse incision. However, insertion of the stent graft in some cases was not so easy, because the arch vessel orifices and the true lumen of the descending aorta could not be clearly seen through this distal ascending incision. To reduce this problem, we introduced the arch open technique in this study. Through this arch open, the arch vessel orifices and the true lumen of the descending aorta could be clearly seen, which resulted in easier and safer implantation of the modified triple-branched stent graft. Although the arch open and close process took 2–4 minutes, the stent graft implantation became easier and faster. Therefore, compared with the first generation of triple-branched stent graft placement technique, time for total arch repair didn’t increase in our series. In type A aortic dissection, the anterior wall of the arch is usually involved by the dissection. Therefore, the arch open and close are frequently performed at the dissected site. After an acute dissection, the dissected arch wall is so fragile that the arch close often results in intraoperative or postoperative hemorrhage owing to tissue tearing at the suture line . In our technique, although the arch open was directly closed with incorporation of the main tube graft without any other reinforcement, there was no problem with bleeding from the suture site either intraoperatively or postoperatively. Actions of the implanted main tube graft and arch stent may contribute to this good result. The implanted stent graft effectively approximated the dissected layers of the arch wall, securely closed the false lumen, and consequently interrupted back flow from the false lumen, which often is a source of bleeding at the suture site. Furthermore, after the arch open was closed with incorporation of main tube graft, antegrade blood leakage from the suture site into the residual false lumen was completely prevented. Theoretically, our modified triple-branched stent graft could be easily implanted through the same arch incision as hemiarch replacement, and the Dacron prosthesis replacing ascending aorta and hemiarch could directly connect to the modified triple-branched stent graft at this arch incision. This hemiarch replacement combined with open placement of a modified triple-branched stent graft technique could eliminate the arch open and close, obviate the need of the arch stent, and consequently appear simpler than our technique described in this study. However, this hemiarch replacement technique could not be preferred by us. Two major advantages of our technique over this hemiarch replacement technique might contribute to our preference. The implanted arch stent could make the main tube graft closely contact to the arch wall, shrink the false lumen and promote thrombosis of the false lumen in the dissected arch. Moreover, once bleeding occurred from the posterior suture line in the hemiarch replacement, hemostasis in this deep portion is difficult. In our technique, we performed the distal aortic anastomosis at the distal ascending aorta and the arch open at it’s anterior wall, which provided a better surgical view, and hemostasis was much easier. In our practice with open placement of the first generation of triple-branched stent graft in more than 100 patients with acute type A aortic dissection, we found that most arch vessels could be easily matched by our prefabricated sidearm stent grafts and difficult match occurred in the distances between two arch vessels and in a few dissected arch vessels with larger false lumen and smaller real lumen. For a dissected arch vessel with a larger false lumen, it was not easy to determine the proper size of the sidearm stent graft, and unusual large sidearm stent graft was frequently necessary. Recently, banding at the bases of those dissected arch vessels was applied by us. Since we routinally used banding technique for dissected arch vessels, no any sidearm stent graft endoleak or stenosis was found. This result suggested that banding technique is an effective alternative to our modified triple-branched stent graft for the good match between the sidearm stent graft and the corresponding arch vessel. Based on these findings, two types (type 1 and type 2) of our modified triple-branched stent graft were produced. In this series, type 1 modified triple-branched stent graft placement combined with arch vessel banding technique was applied more often than type 2 modified triple-branched stent graft placement, mainly because we believed type 1 modified triple-branched stent graft placement combined with arch vessel banding technique was simpler and had less chance of sidearm graft stenosis. Implantation of sidearm stent graft and fold of sidearm polyester tube graft inside the corresponding arch vessel might produce sidearm graft stenosis or occlusion. Although no sidearm graft stenosis or occlusion was observed in our series, the long-term patency of those sidearm grafts should be carefully evaluated. Fortunately, fold of sidearm polyester tube graft inside the smaller arch vessel could be easily avoided by using our type 1 modified triple-branched stent graft. The long-term patency of the sidearm stent grafts of the type 1 modified triple-branched stent graft is expected to be satisfactory because simple endovascular stenting for arch vessel provides satisfactory long-term patency even in stenotic obstructive pathologies -. In the traditional total arch replacement for acute type A aortic dissection, the elephant trunk was routinally applied to achieve a stronger distal anastomosis and to facilitate subsequent surgery on the distal aorta . However, placement of the elephant trunk into the true lumen of the dissected descending aorta is difficult and some complications, such as kinking and obstruction of the graft, embolization and paraplegia, have been found . To reduce such problems, stented elephant trunk technique was developed ,. This stented elephant trunk has been proven to be an effective way of closing the residual false lumen of the descending aorta, which might contribute to better long-term outcomes for acute type A aortic dissection . In our modified triple-branched stent graft, the distal part of the main graft was designed to be a stented elephant trunk. 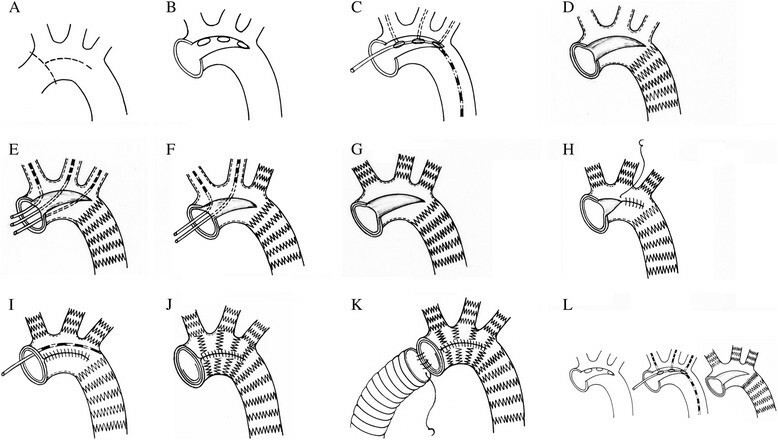 Therefore, both the scope of the repaired thoracic aorta and the outcome of residual false lumen of our modified triple-branched stent graft placement technique should be comparable with the traditional total arch replacement combined with stented elephant trunk technique. Recently, some other techniques have been developed to simplify total arch repair for acute type A aortic dissection. Total endovascular arch repair using a fenestrated stent graft or using a conventional straight stent graft with arch debranching is an effective technique to complete arch repair for acute aortic dissection . This technique can be performed off-pump. Consequently it would be less invasive than our technique. We also performed this technique for some patients with acute aortic dissection and satisfied results were obtained. However, only normal ascending aorta can provide a proximal landing zone in this technique. Therefore, it can not be used in the patient with a patent false lumen of ascending aorta. Enlightened by this total endovascular arch repair technique, some surgeons developed a new hybrid operation to get the effective total arch repair for acute type A aortic dissection, in which the dissected ascending aorta is replaced with a Dacron tube graft under cardiopulmonary bypass with moderate systemic hypothermia, and arch vessel bypasses from the Dacron tube graft and antegrade or retrograde deployment of a conventional straight stent graft into the arch and the proximal descending aorta are performed . This hybrid technique eliminates the need of deep hypothermic circulatory arrest, but arch vessel bypasses are difficulty if arch vessels are seriously involved by the dissection and their long-term patency should be carefully evaluated. Shimamura et al. also developed open branched endoprosthesis placement technique . 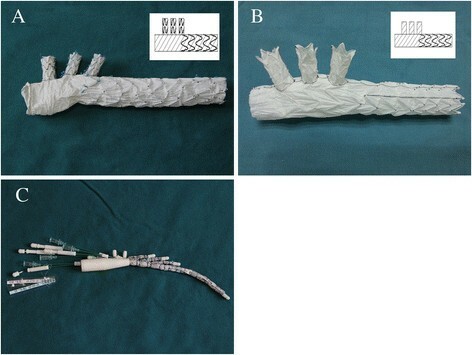 Although the branched endoprosthesis used in their technique seems similar to our modified triple-branched stent graft, the original idea of the design is totally different. In shimamura’s branched endoprosthesis, sidearm stent grafts were connected to the main graft in the side dish during the procedure, and the size of each sidearm stent graft and the distances between 2 neighboring sidearm graft were decided by each patient’s corresponding sizes which were determined by the measuring results using preoperative computed tomography. Therefore, it is impossible to be commercial. Our modified triple-branch stent graft was designed to provide a good match with the different diameters of the native arch vessels and the various distances between two neighboring arch vessels, so it can be commercial and be used in most patients. The modified triple-branched stent graft could provide a good match with the different diameters of the native arch vessels and the various distances between 2 neighboring arch vessels, and it’s placement could become much easier by the arch open technique. Therefore, placement of a modified triple-branched stent graft could be easily used in most patients with acute type A aortic dissection for effective total arch repair. Rigorous long-term follow-up and further extensive clinical trials are necessary to completely evaluate the efficacy of the modified triple-branched stent graft and the arch open technique before this combined technique can become a reliable alternative to conventional total arch repair. CLW, LC participated in reseach design; CLW, WXJ, DXF, LDS, LQZ performed the experiments; CLW, LL, LC participated in the writing of the manuscript and indata analysis; LL, LC carried out the follow up. All authors read and approved the final manuscript.